It isn’t that I didn’t really believe that I wouldn’t be surprised by some of the things I encountered in the US after my term abroad, but I was slightly skeptical of calling it a form of “culture shock.” However, after being in the US now for a full week I would agree that I have experienced a form of culture shock back here in the States. The strangest thing of all is that it is the little things that are very strange to me. Seeing well nurtured cats and dogs (my pet cats at home look so pampered and fat now), so many people looking at their phones all the time, how fast people walk, and other things like that. And being in such a new and exciting place, then coming back to the place I live everyday has also been a strange, but interesting experience. Things are the same, but I see them a bit differently now that I am back than I did before I left home. Usually these “culture-shock” experiences are not too bad, but it does feel a bit unusual. Every once-in-a-while I get a strange feeling. I can’t really place what the reason for that feeling is, it just is a bit different, confusing, but also sometimes humorous. However, that said, I did have one day when things got a bit hard. After leaving Samoa, I spent three days staying with friends in Hawaii. On my second afternoon I tried to do a little souvenir shopping for my family in Waikiki. For the fun of it, I thought I would walk through and browse through a popular alternative clothing store. (This was probably a mistake from the beginning, as I had been walking through heavily touristed Waikiki all morning and was already feeling tired.) Instead of finding cool new styles and admiring people’s fashion choices like I normally do, I got frustrated at how connected everyone was to their phone (people bumped into me while texting and didn’t even apologize), how crowded it was, and just in general how materialistic people seemed to be. I soon grew angrier and angrier. At first it was frustration, but the more I stayed in the store (and the more I was surrounded by stimuli), I got angry. I was confused and overwhelmed, and I couldn’t place the reason my frustration and anger. That made me even more angry. By the time I left the store I was in pure rage with no real reason for that feeling. Overall, it was a really unpleasant experience, but I was able to cool down pretty quickly after I returned to my friend’s apartment, and soon I was laughing at how strange it all felt. Aside from this experience however, I haven’t found adjustments to be too bad, just a little different. Though a few (a VERY few) bits of adjustment have been hard, I am doing well with re-entry. I really like noticing things I wouldn’t necessarily have seen in my own culture and society before leaving. Studying abroad not only teaches you about different cultures, societies and people, but it gives you a new, thought-provoking, and even at times, humorous view of your own, and you also learn a great deal about yourself and your own personality. I highly recommend going abroad as it truly has been (pardon the cliché) a life-changing experience for me! Lost in Paradise or Paradise Lost? As my semester has come to an end, I am able to look back on these past three months and see how much I have learned and see all the fantastic experiences I have had. It is impossible to sum up a whole semester of experiences in one blog post, and therefore, I will not even try. However, over the semester I have learned a lot, and I feel that I have grown in many ways. Below are a few things I noticed about my host country, my own country, and myself. 1.) Paradise does not exist. Samoa is beautiful. It has the most vivid colors I have ever seen in my life; emerald greens, sapphire blues, and fiery reds. The natural landscape is equally stunning, made up of ancient, jagged volcanoes, crystal waters, and palm frindged beaches. And Samoan culture is wonderfully preserved and adapted, and is truly unique. Yet, all of this exists side-by-side with poverty, urban sprawl, overflowing rubbish, underdeveloped resources, and lack of opportunity. The South Pacific has been romanticized and fantasized over the years,a and many people only see it as it is portrayed in the media, not in reality. I am not saying this to be harsh on Samoa or Samoan people, but there are serious issues in Samoa, just as there are in the US, or any other country. Samoa, like anywhere else in the world, has good and bad, and to label its landscape, people or culture as “paradise” is too simple an explanation to describe Samoa and the “fa’asamoa,” or the “Samoan Way.” The only way to really understand Samoa is to see it in person. I really have come to love Samoa dearly, and hope to return in the future. I will not be going to the Samoa of romantic fiction, but to the one I know and have come to love just as it is; with all the good and bad that comes with it. It truly is an intriguing place with things for everyone to see. Visit Samoa and see the beauty of the country and the culture, as well as all the complexities that come with it! 2.) You can survive without technology and creature comforts. OK, so before this trip I liked to believe that I wasn’t attached to my phone, iPod, internet, Facebook, etc… However, after this program, I am able to see how untrue this really is. Mass media has become such an important part of main-stream American culture, that I hadn’t even noticed all the little ways it affected my life. I survived just fine without being on my phone all the time (in fact, it was hardly ever on), without Facebook or much internet (Facebook was only available at night, and only IF the internet was working that day), and even without the comfort of a hot shower every morning or many choices for leisure/food. I made it just fine throughout the semester, and in fact, I feel that I was able to do many things BECAUSE I wasn’t constantly connected (like reading over 15 books just for fun, or seeing sites in Samoa others may not have had the chance to see). 3.) The best way to learn is to do it yourself! During study abroad we were able to have quite an array of learning experiences. We has class lectures, readings, and discussions. However, the most helpful mode of learning was to just go out and do things. As part of SIT, we took many excursions to different locations in Samoa and the Pacific, and even just day trips to neighborhoods and organizations in Apia. Either way, I learned the most from these experiences. It is one thing to sit around and talk about aspects of Samoan culture (like the traditional Pacific art forms), but it becomes personal when you go out and experience it firsthand (like learning traditional and contemporary Samoan dances and seeing the role they play in today’s society). And by experiencing these things I am better able to understand what the lectures and readings relate to, and I appreciate it much more. I am so glad that SIT was set up in a way that offered many opportunities to go out and do things, and I attribute much of what I learned to the time I spent on excursions, home stays, and outings. I had a fantastic time on study abroad, and would do it again in a heartbeat. And to study abroad in the South Pacific was a dream-come-true for me. I learned a lot, and it was not easy. But I feel that studying abroad should not be easy, but challenge you to think and reinterpret your surroundings. 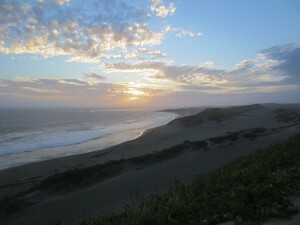 I really enjoyed my time in the Pacific, and I look forward to a time when I will be able to return. Until then, I highly encourage anyone interested to go and check it out. There is so much to see and learn, and there really is something for everyone. Tofa Soifua, and safe travels to everyone. Have a great adventure! Posted on January 7, 2015 June 6, 2016 Author MacKenzie CoyleCategories Academics, Culture, Daily Life, TravelTags Oceania, SamoaLeave a comment on Lost in Paradise or Paradise Lost? As a part of every SIT study abroad program, students must complete an Independent Study Project, or ISP. Usually the ISP has something related to the overall theme of the program and consists of a 20-30 page paper (depending on the program), and an oral presentation on your topic. 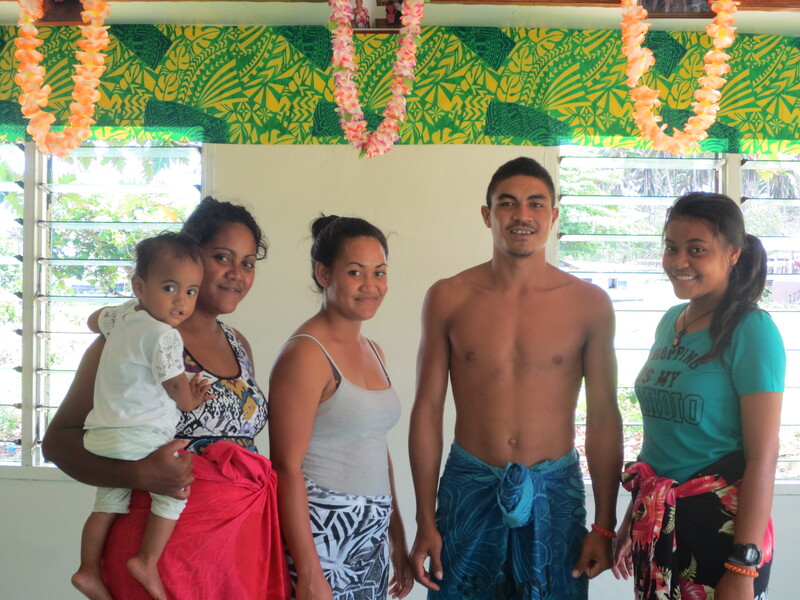 This SIT Samoa program is about traditional societies transitioning into the modern world. It talks about traditional life in Pacific communities, and how it has been changing overtime with globalization. Because of this broad scope of ideas, we are allowed to have a great deal of freedom with our ISPs. Students have looked at religious views of tattooing, Samoan beauty pageants, and the presence of traditional stories and legends in contemporary society. There are so many options one can choose from. My topic is about the Japanese International Cooperation Agency and education. 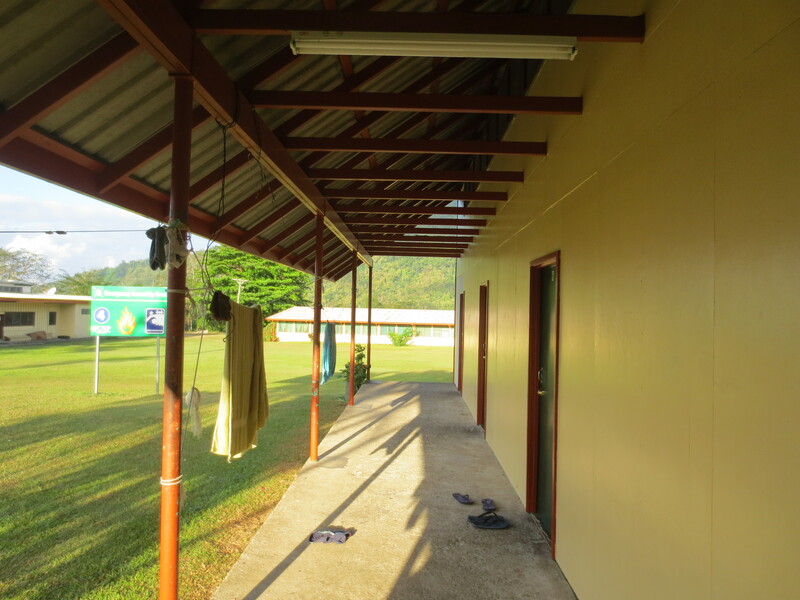 As a small island nation, Samoa is still developing many of its social and economic infrastructures, and Japan has been a big aid donor to Samoa to develop these things. I found this very interesting (especially as a Japanese major at Hope), and therefore I am looking at the role JICA and Japanese aid plays in developing educational opportunities in Samoa. ISP research consists of interviews, surveys, and data research. It was really interesting to go out and meet many different people and ask them questions about JICA and the Samoan education system. I learned a lot, and I really enjoyed the process (though at times was frustrating when people would not get back to me or I could not find the information I was looking for). The ISP period began November 6 and lasts through December 2 when we present our findings. As of right now, I sent in my ISP paper and will present it in just a few days. And although I am a bit nervous, I am relieved that the paper is done and all I have to do now is work on the presentation. My advice to those thinking of going on an SIT study abroad is this. Do not put off your ISP research. Three weeks at first sounds like a lot of time, but that will change really quickly when you are thrown into it and you need to work around people’s schedules. That said, I learned a lot about how to do academic research, and I had a lot of fun doing it. 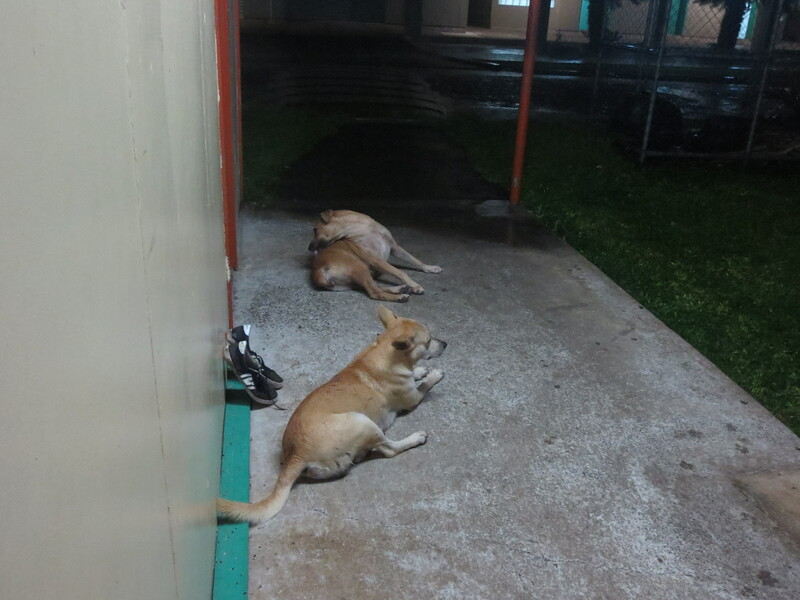 Dogs outside my door at night. 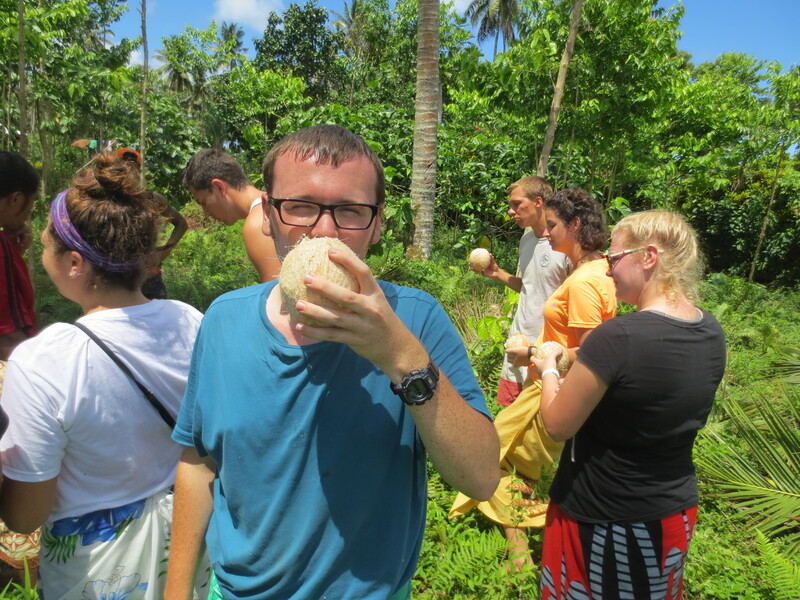 I really have enjoyed my semester abroad in Samoa. It is a fascinating place, and a unique travel destination. I happily recommend it to anyone willing to get a bit “off the beaten track.” That said, this semester I feel like I would like to acknowledge something that has troubled me this semester. After all, Samoa is a real place with real problems. One of these that I wanted to touch upon is the abundance of dogs. 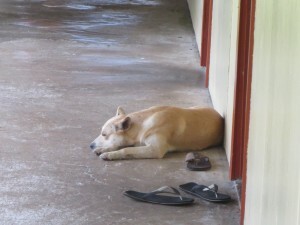 Dogs are a real problem in Samoa. You see them everywhere; in the countryside, in small villages, downtown Apia, and even out on the university campus. 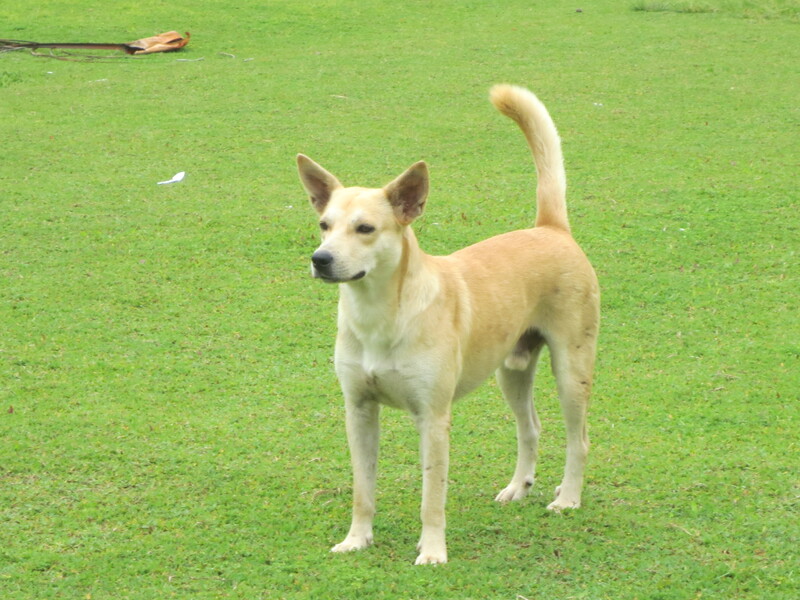 Many are strays that just roam around, but some are protective family dogs which also wander but can be aggressive if you approach the property. Samoa is not a place for canine lovers. Though dogs are abundant in here, they are not the nice, clean cute little pooch that will curl up on your lap by the fireplace. Instead, they are dirty, often injured, and can be very aggressive. At night, some travel to and fro in packs, fighting and howling through the night. And it can be quite intimidating to be walking down the road and come across one of these dog packs. 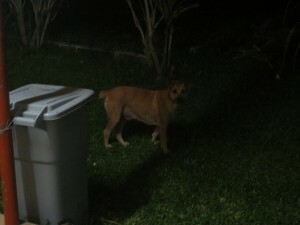 A dog outside my door at night. This year Samoa held the Small Islands Development Conference, and therefore has really been cracking down on the number of vagrant dogs wandering the streets. They issued a law stating that every family must pay 30 tala to have their dog registered and have a collar for their dog. If any dog is caught without a collar they are to be euthanized. And although there are still a large number of dogs roaming the streets (more than I ever have seen), I have been assured multiple times by many people who say the dog problem is a lot better now than it had been previously. If you come across an aggressive dog, locals have a strategy. First, they make a hissing sound (like telling someone to be quiet), a loud Shhhhhhhhhhh, followed by the Samoan word “alu!” or “go!” Than locals will bend over to pretend to pick up a rock. I will say that this is effective about 95% of the time, and the aggressive dog will usually tuck its tail and run away. Yet, on occasion, I have seen a local actually throw a rock at a dog who will not leave them alone. 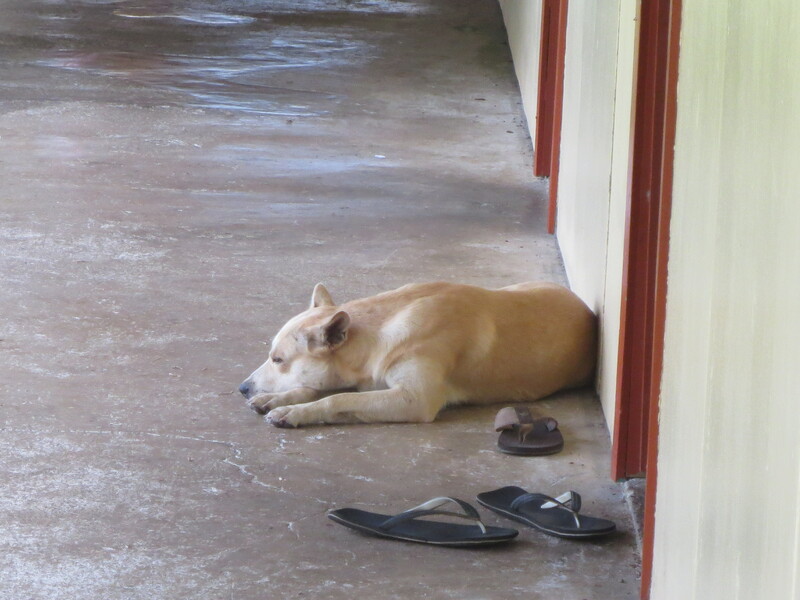 Though personally I have never had an issue with dogs in Samoa, it has definitely been a challenge for me to see them here. Many do not look so well and either are sick, malnourished, or injured. And though I have never had a bad incident with a dog here, I have on occasion had to bend over as if to pick up rock to scare one or two off that was a little to interested in me. The whole experience is very off-putting, and is difficult to get used to. This has been something I really struggled here. 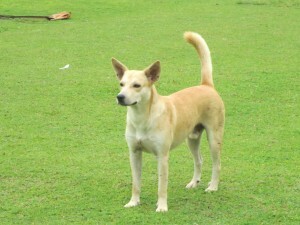 And though not all dogs are aggressive (most of the dogs roaming the campus are fine), they nonetheless take some real getting used to. 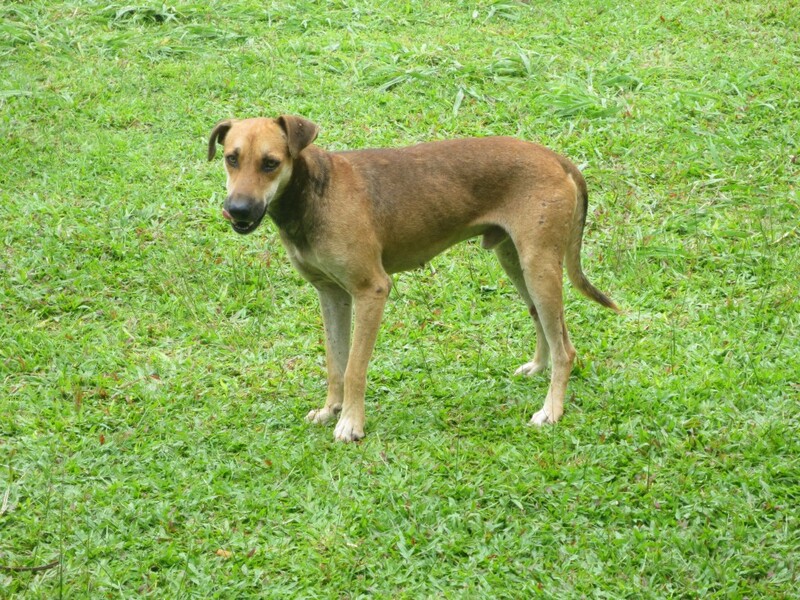 I do not write this to dissuade anyone from coming to Samoa, but it is important to note that Samoa still is a developing country, and as such really has a few problems such as the roaming packs of dogs. Lunch with my Abaca family. 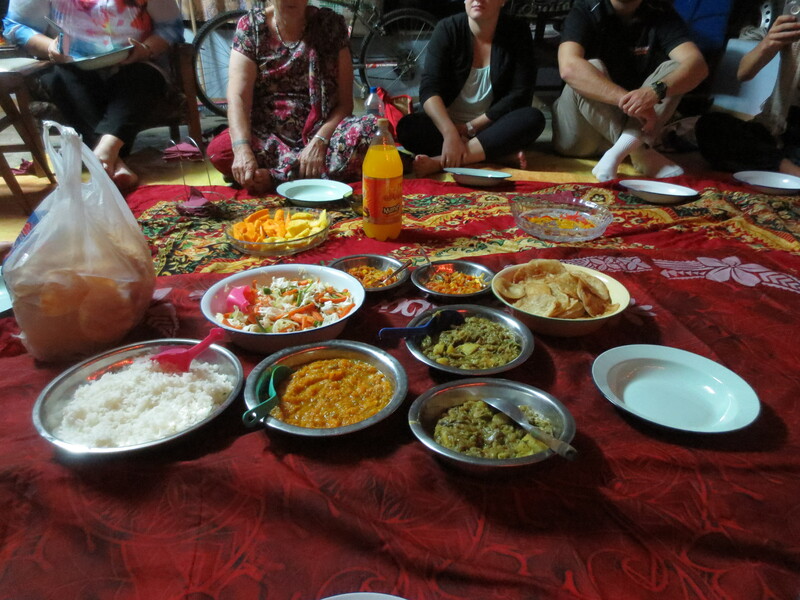 Our Diwali feast at Prem’s (our bus driver and tour guide) house. This past week I went on my last SIT excursion. 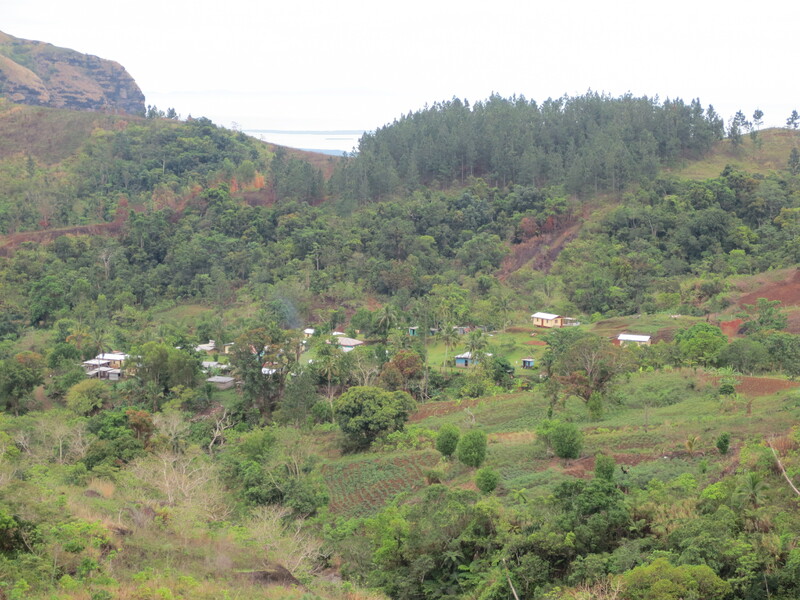 We spent one full week on the main island of Viti Levu in Fiji. What an experience that was. We arrived on October 25, which happened to be a big holiday in Fiji, the Hindu festival of lights called Diwali. 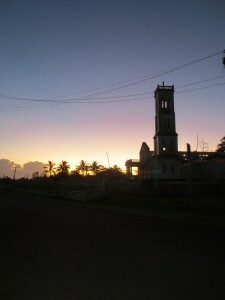 Fiji’s population is divided roughly in half between the indigenous Fijians and Indo-Fijians (who were descendants of Indian laborers who came between 1880 and 1920), and therefore many Hindu and Muslim holidays are celebrated along with Christian holidays, making Fiji an extremely diverse country. After arriving in Nadi, we were invited to our bus driver’s house for a large Indian feast and to set off fireworks in honor of the last night of Diwali. It was full of fun, fire and food, so what more could you want? 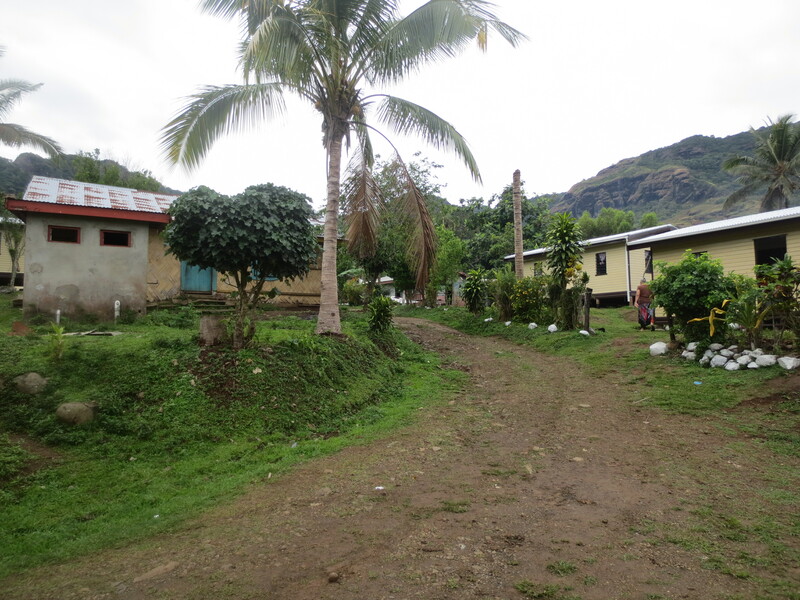 The next day we woke up early and drove to the village of Abaca. Abaca is an eco-tourist village located in the Fijian highlands. 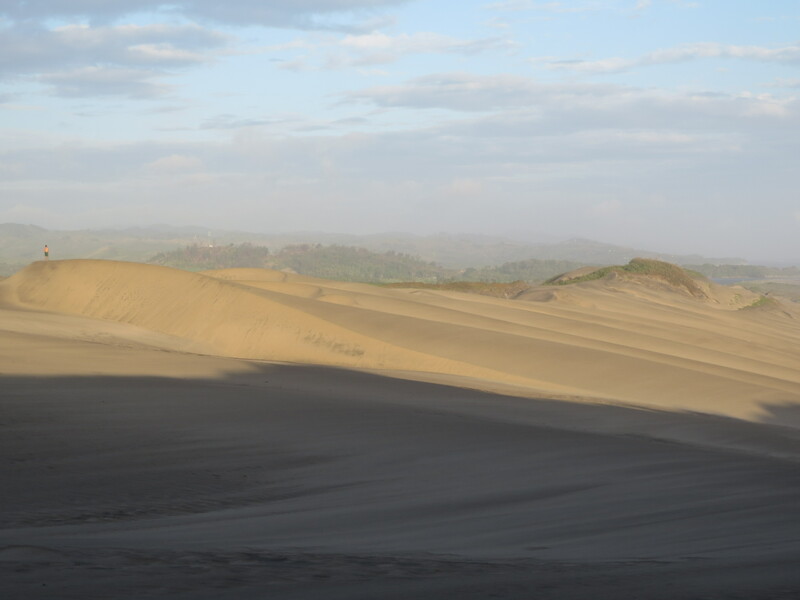 It is a town of less than 60 people, and we had to take rough, unpaved roads to get there. But it was worth it. 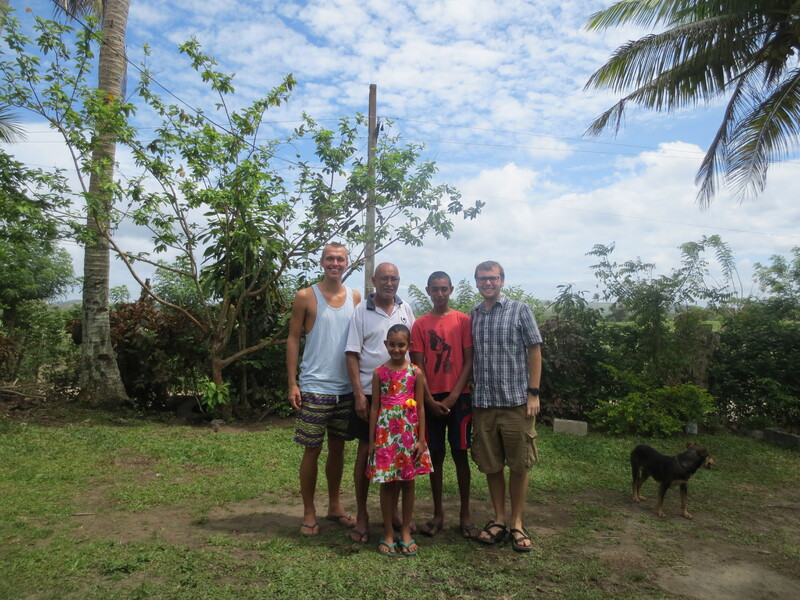 We each stayed with local families and learned about Fijian culture from them. 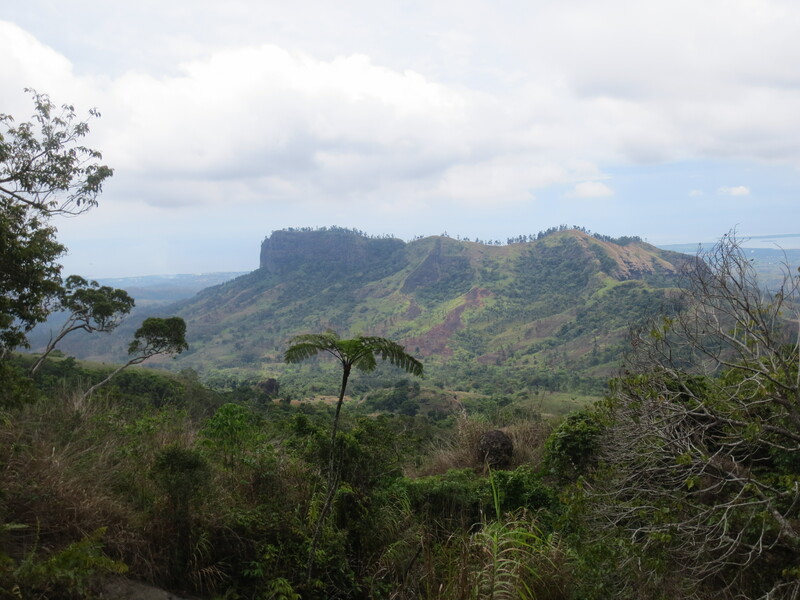 The town was absolutely beautiful, and we hiked up mount Batilamu, one of the highest mountains in Fiji. We began and concluded our stay in the village with a kava ceremony, as that is the Fijian way of hospitality, and kava is Fiji’s national drink (kava is made from the root of the pepper plant and it is used in various ceremonies throughout the South Pacific region). After leaving Abaca, we drove to the Fijian capital Suva, and stayed there for two nights. Suva is one of the largest South Pacific cities, with about 300,000 (nearly one half of the total Fijian population) people in its urban area. While there we visited the main University of the South Pacific campus, and walked through a squatter settlement (there are many squatters in Suva, some being evicted from their land after land leases expire, while others hope for better educational and employment opportunities). After living in laid-back Samoa, a country with half the population of Suva, the city itself seemed so large, busy and hectic. 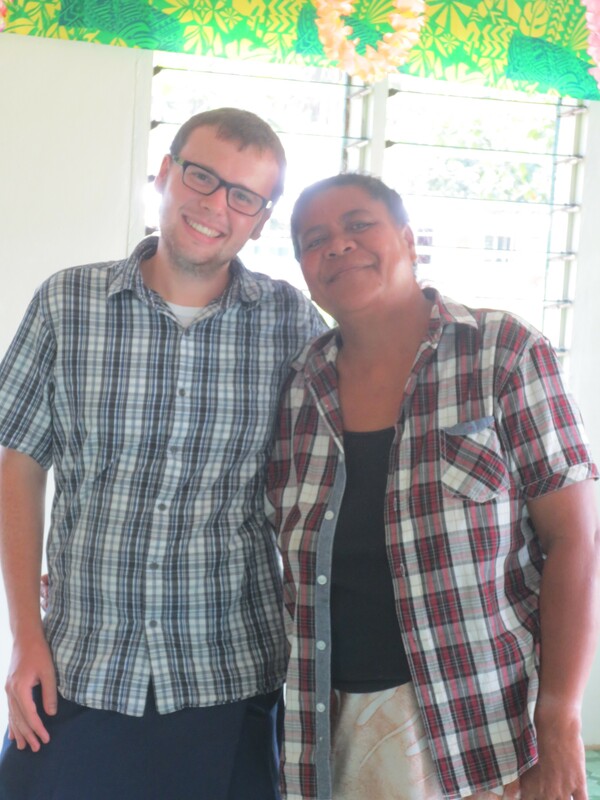 I was completely overwhelmed in Suva, and it was a really interesting experience, causing me to wonder what it would be like when I returned back to the US. Though I thought Suva was interesting, it was a real shock, and I still do not feel as though I liked it very much. It was so busy, dirty and edgy, that I didn’t ever feel attached to it. After leaving Suva, we went to Kulukulu for two nights, and did one final home stay with an Indo-Fijian family. I learned quite a bit about Indo-Fijian culture, and it is unique and distinct even from that of India (Fijian Hindi is often considered its own dialect or language). It was really interesting to see the two different sides of Fiji. Indo-Fijians and indigenous Fijians now live peacefully side-by-side, but that has not been the case. Since gaining independence in 1970, Fiji has experienced four coups (two in 1987, one in 2000, and one in 2006) which were all in one way or the other, related to ethnic tension between the two groups. It has been a long road, but today Fiji is a beautiful and unique country, and all Fijians are working hard to improve their country for everyone. I hope someday to return to Fiji and learn more about its culture, both Indian and indigenous. 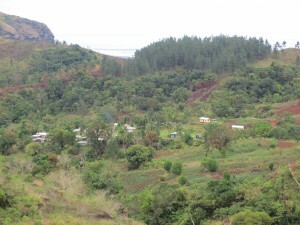 View of the Fijian highlands. 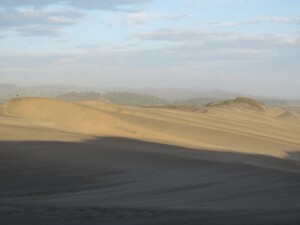 The Sigatoka sand dunes at Kulukulu. My friend Detmer and myself with our Kulukulu family. 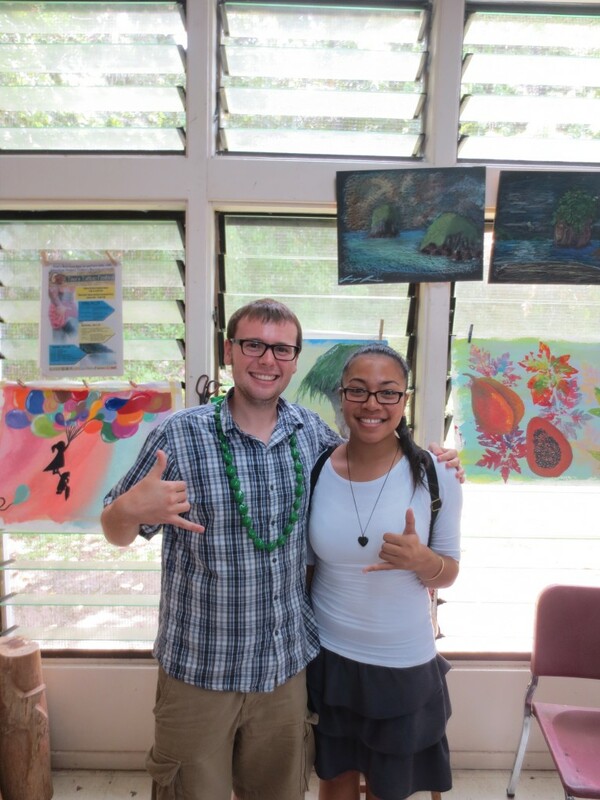 My host sister Siuila and I at the American Samoa Community College art room. 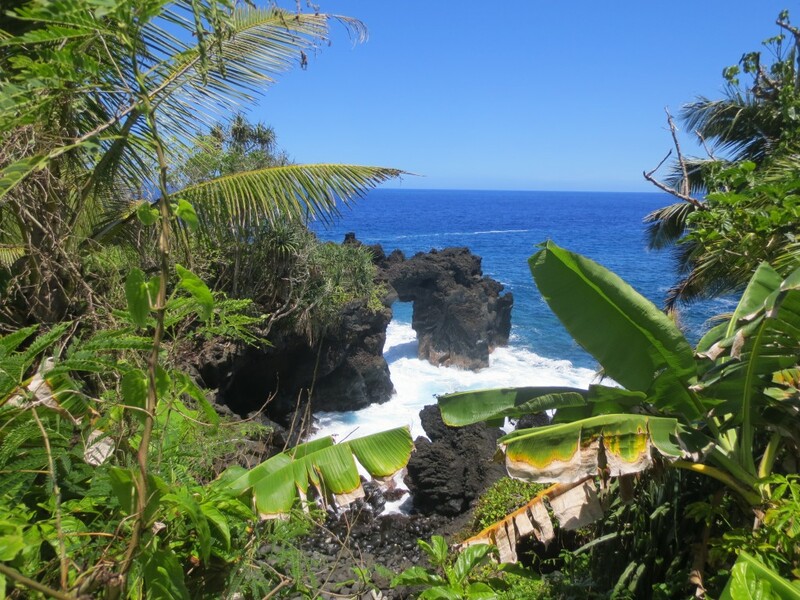 Last week we had an outing to the other Samoa, American Samoa. The Samoan islands were divided by the Germans and the Americans in 1899 after a few brief skirmishes. The Germans took Western, or what is now Independent Samoa made up of Savaii and Upolu, while the US took the islands of Tutuila and Manu’a under what was then known as Eastern Samoa, now American Samoa. My host father Fale and my host mother Heidi at their home in American Samoa. During our stay in American Samoa, we were all hosted by members of an honor society at the American Samoa Community College. I stayed in a family of four. My host parents Heidi and Fale, and my host sisters Lillian and Siuila. I grew very close to my home stay family, and even though I lived an hour away on the other side of the island, I would not have changed a bit of my visit. Contrary to what many of us had been told, I found American Samoa to be extremely beautiful. Unlike Upolu and Savaii, there is no flat land. 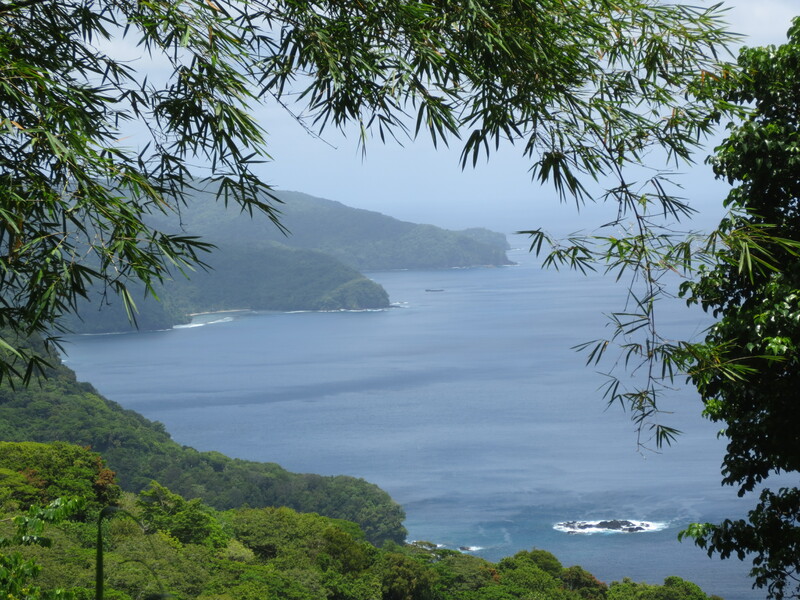 Where the islands of Independent Samoa gradually slope from sea to mountain, in American Samoa it is much more dramatic. Steep, intensely green mountains and cliffs drop straight into the Pacific Ocean, causing a true sense of wonder and awe. Mt. Matafao, the highest mountain on Tutuila dominates the skyline from Mt. Alava. 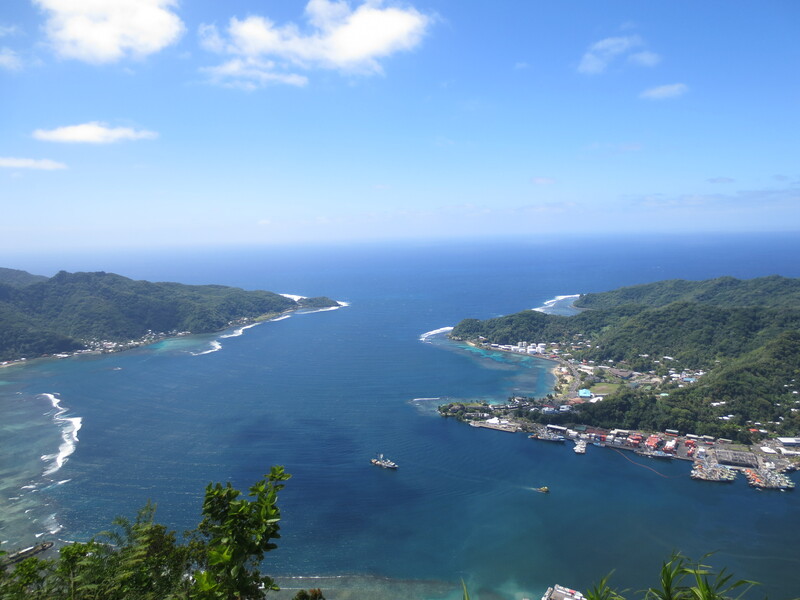 The people and culture of American Samoa where exceptionally intriguing as well. American Samoa has found a balance between the traditional Samoan way called “fa’asamoa,” and American cultural values. For example, every night my family and I would eat a combination of “American foods” (mac and cheese, potato salad, spaghetti, and desperately needed tacos) and Samoan foods (fresh fruit, taro, breadfruit, and fresh fish). And while we ate we would watch the national news first, then halfway through dinner the local American Samoan news, which used only the Samoan language, would come on. It was quite fascinating. Another interesting culture mix about American Samoa is the government system. In Independent Samoa, if one were to be in the national parliament, one had to be a “matai,” or a chief. The same rule applied in American Samoa. The government is broken down similar to that of the US government with a Senate and a House of Representatives. However, while the House of Representatives may be filled by anyone in American Samoa, one needed a chiefly title to be in the Senate, an interesting way of mixing US and Samoan governing styles. 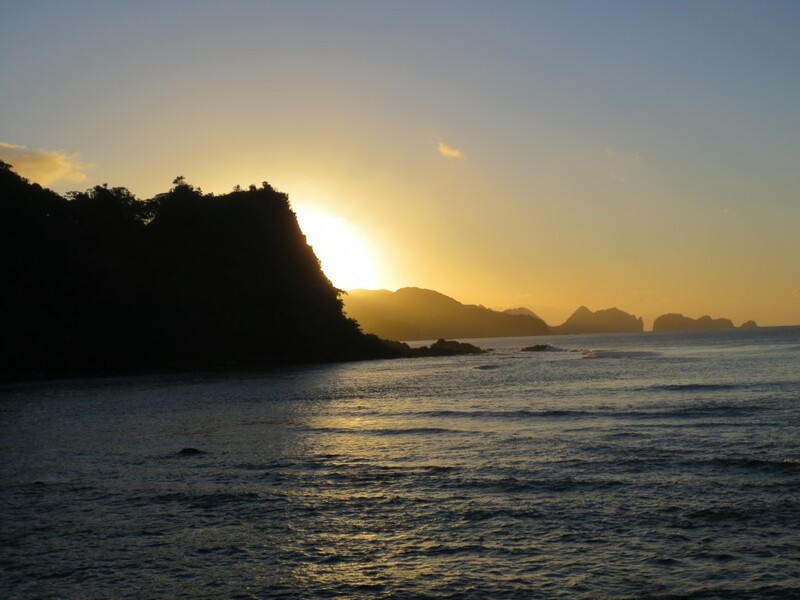 Though I loved American Samoa, there were many, many problems, I noticed while in the territory. For example, many young American Samoans have lost touch with the Samoan language. In my host family, only my host father spoke Samoan fluently, and one host sister spoke it well, but the rest could not speak any. This, as I learned, is not unusual, as classes are all taught only through English, and follow the curriculum used on the mainland. Another big problem in American Samoa was obesity. With the rise of fast food restaurants, and preservatives added to the food to reach the island before spoiling, many of the foods available in American Samoa are very unhealthy. And though there are many programs working to teach good nutrition and exercise, there has been very little success. Obesity and other lifestyle diseases, though an issue all throughout the Pacific region, are particularly bad in American Samoa. On my trip to American Samoa, I saw the good, bad and the ugly. Yet, overall the place captured my heart, and I hope to someday return to visit beautiful Tutuila, and my wonderful home stay family. 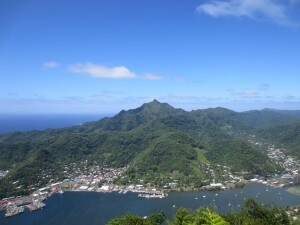 A view of Pago Pago harbor from Mt. Alava. 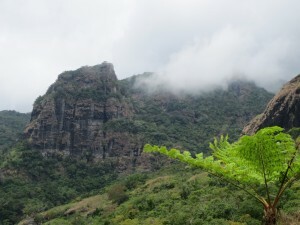 View of northern Tutuila from the trail to Mt. Alava. Sunset at Pola Island on Tutuila. 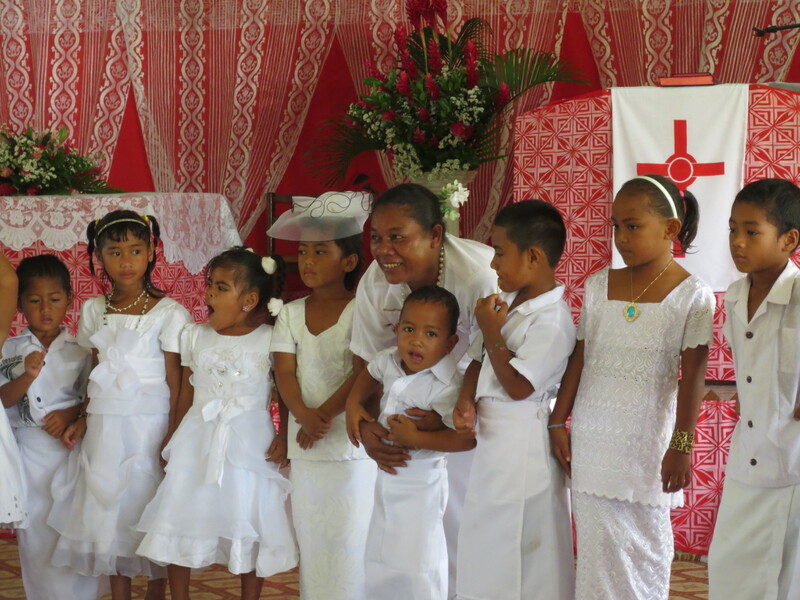 One of the adult helpers with the children on White Sunday. 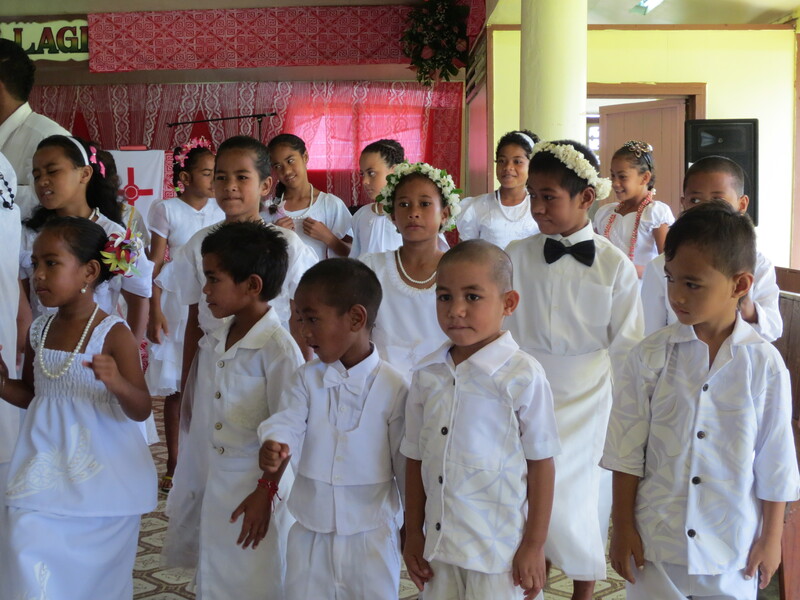 October 12th was one of Samoa’s biggest holidays–White Sunday. White Sunday originated with the arrival of the London Missionary Society in 1830. It always falls on the second Sunday of October, and it is a church service in honor of the children (in Samoan it is known as “Lotu Tamaiti,” or “The Children’s Service”). My SIT group went back to our Lotofaga families for the occasion. On Sunday morning, we all woke up, dressed in white, and went to the church. The pastor led the congregation of adults in a brief prayer, then the children of the congregation filed into the church while singing and dancing. On White Sunday, aside from the opening and closing prayer, the pastor has no direction over the service. Instead, it is led by all of the children of the congregation. The service was full of singing, dancing, short skits, and memorized Bible verses. It was a fun time for the children performing and leading the service, as well as the adults watching. 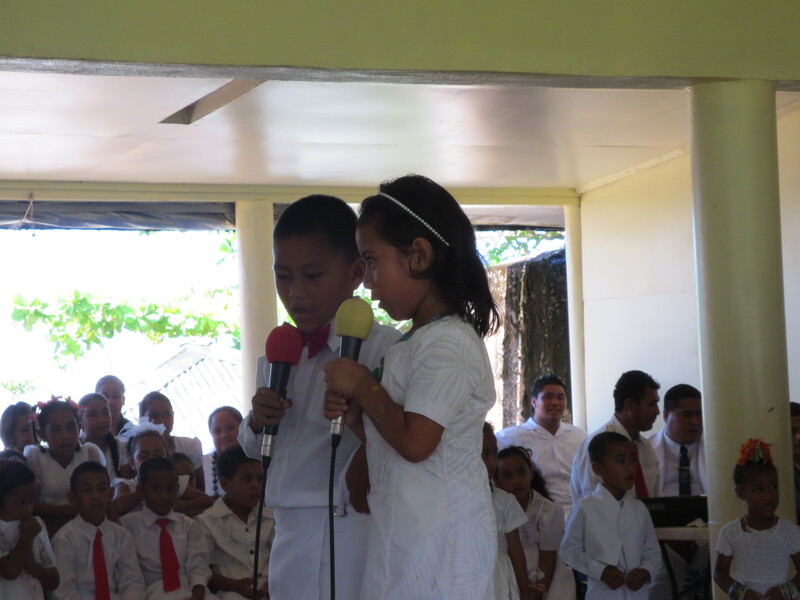 Children reciting Bible verses from memory. After the service, children go back home and have a big feast. Normally the Sunday brunch, or “to’ona’i,” is quite large, however on White Sunday it is enormous. There are piles of fish, chicken, pork, sausages, chicken stew, macaroni and potato salad, oka (raw fish in coconut milk), palusami (taro leaves in coconut milk), mackerel and coconut milk, taro and breadfruit. I came nowhere near finishing my portion. And because White Sunday is always about the children of the family, they get to eat first (usually they are the last to eat because they have the lowest status in the family), and they get to have cake and ice cream, things only eaten on White Sunday or other holidays. They also receive a few gifts as well, such as new clothes, or a few toys. It was a really fun time to be with my host family. I felt very lucky indeed to be able to visit the Samoan village on White Sunday, one of the most exciting times of the year. In the moment on White Sunday. 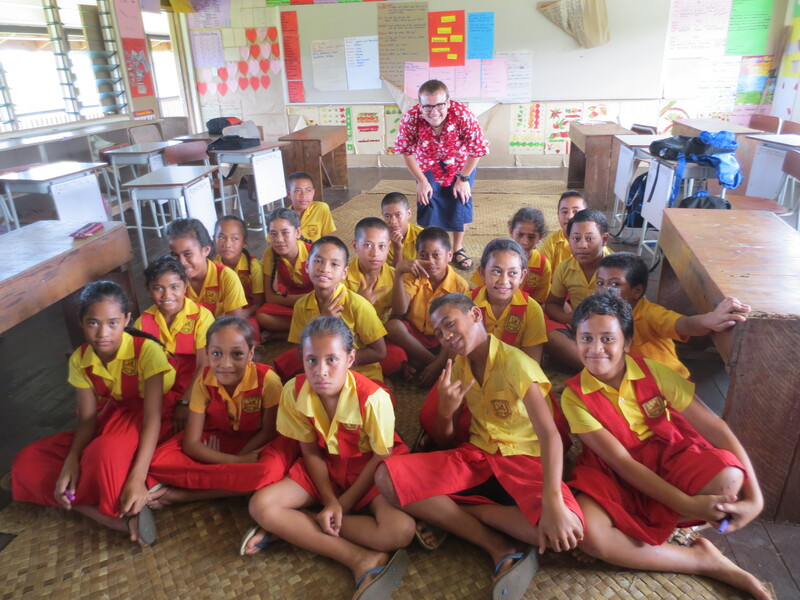 This past week I went on an excursion with my class to Savaii. The country of Samoa is made up of two big islands, and a few smaller ones. For the past month, I have been living on Upolu, the smaller but more populated island. Savaii is the big island to the northwest, with the small islands of Manono and Apolima between the two. After an hour and a half bus ride and an hour-long ferry ride, we finally arrived in Savaii. 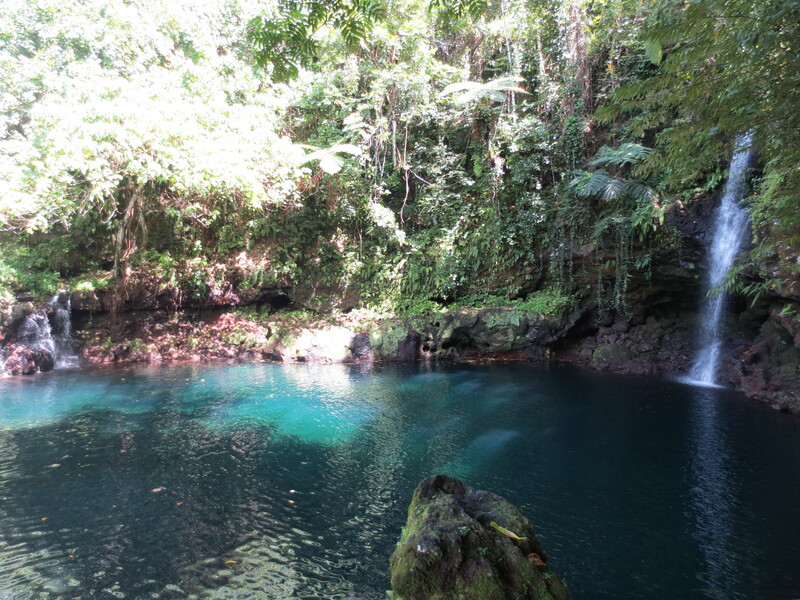 Savaii is unbelievably beautiful, covered with thick rainforest and high volcanic peaks. Being less populated than Upolu yet much larger, it was made up of sleepy Samoan villages divided by long stretches of thick vegetation and natural scenery. 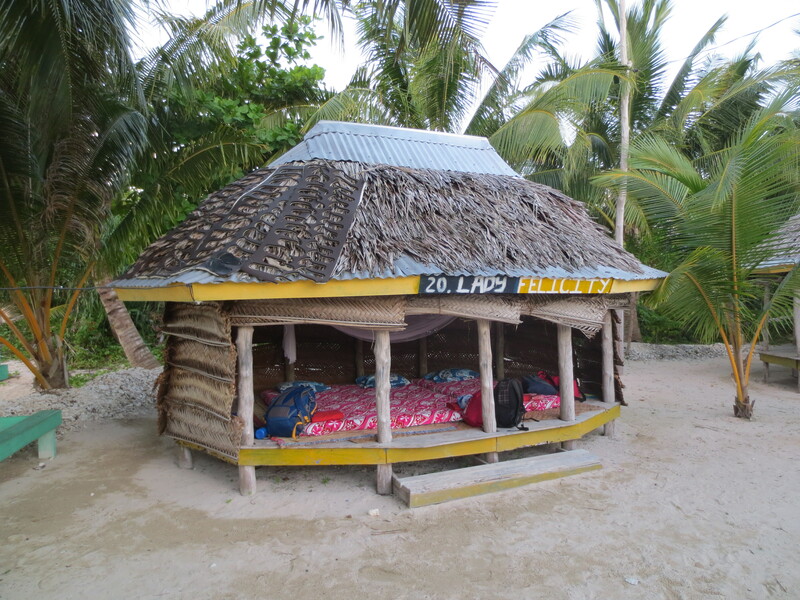 My “fale Samoa” at the Tanu Beach Fales. A view from the ocean. 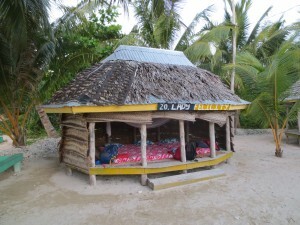 After getting adjusted, we went directly to the village of Manase where we stayed in the Tanu Beach Fales. If you ever come to Samoa, I recommend staying in a beach fale. 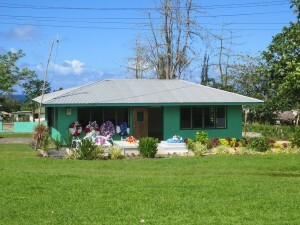 A fale is a traditional open Samoan house. 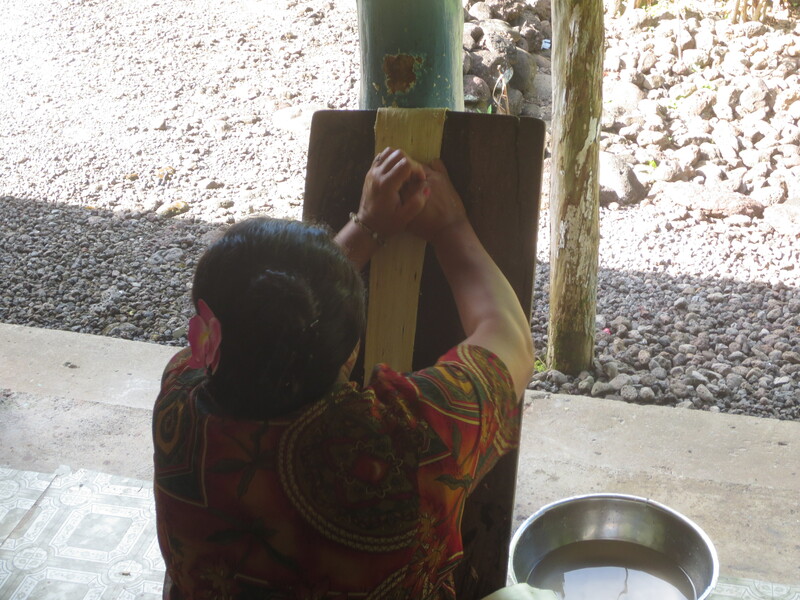 It is round and made wooden posts supporting the roof (in our case it was made of palm thatch). The fales then have palm blinds that may be pulled down in case of rain or for privacy. 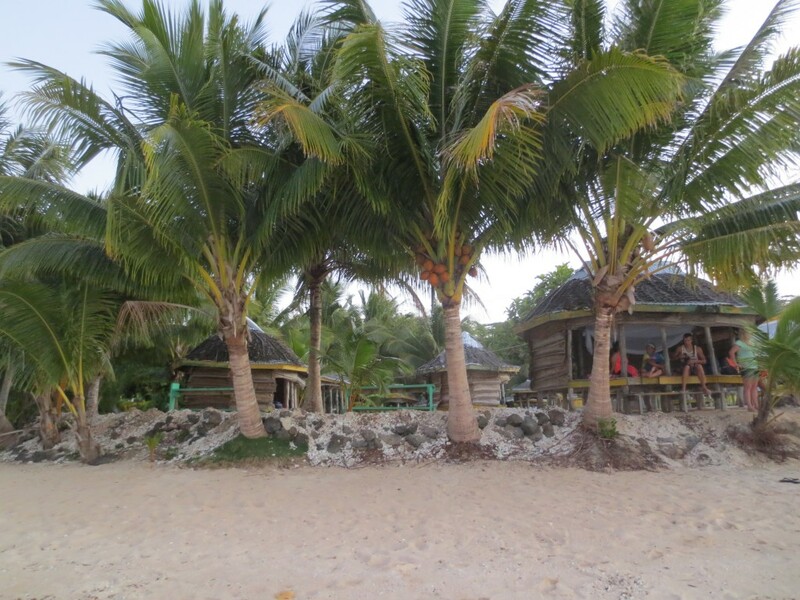 The most amazing thing about staying in a beach fale is that you are right on the ocean. We were situated not just near the beach, but literally on the beach. It was such an amazing experience to fall asleep to the sound of the waves at night, and to watch the sun rise up over the ocean in the morning. 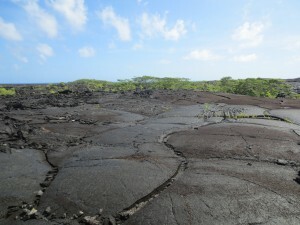 Samoan lava flows from the 1905 volcanic eruption. 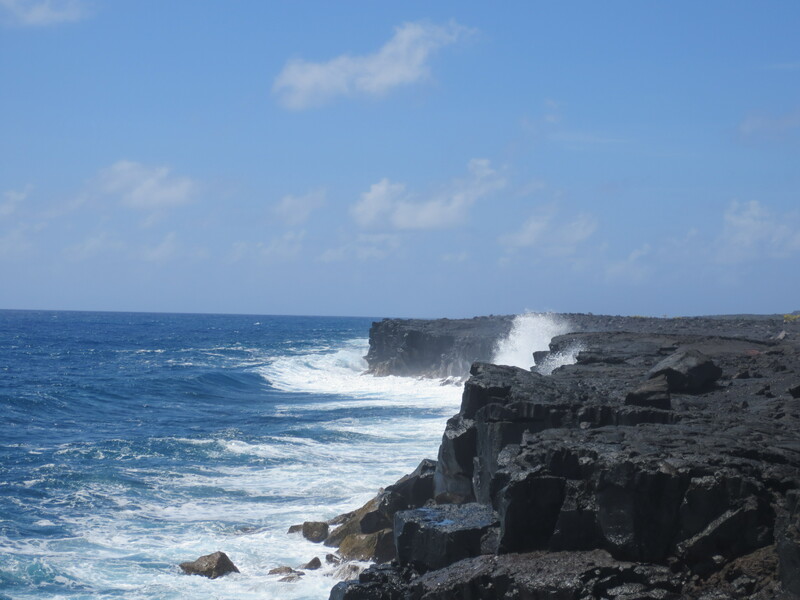 Where the lava fields meet the ocean. Though our stay in Savaii was relaxing, it was not just a vacation. We took day trips around the island with a geologist from Australia named Warren. He was quite a character! 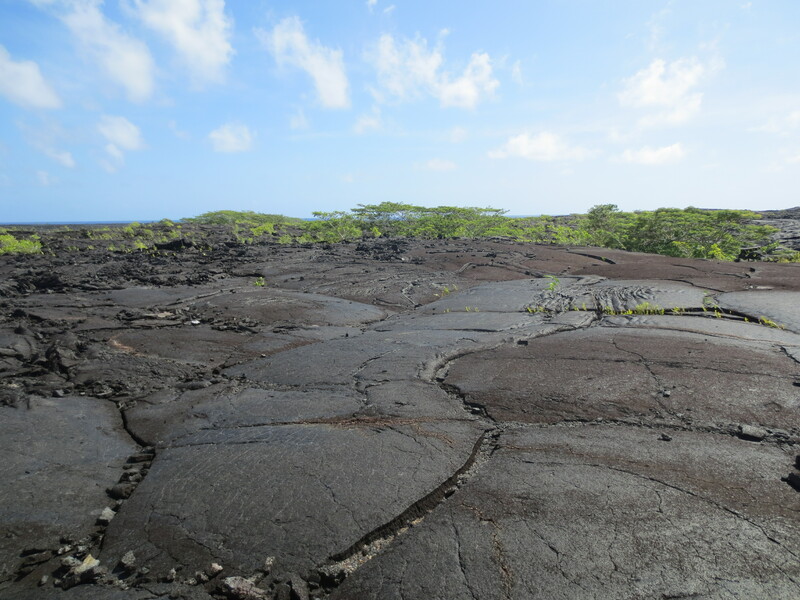 I would never expect an 85-year-old man to be hiking with college students on lava fields (from 1905-1911 there was a large volcanic eruption on the northern coast of the island), or taking us to volcanic craters, but he did. In addition to lava flows we got to see ruins, Polynesian mounds (mounds built by ancient Polynesians for yet unknown reasons), blowholes (ancient lava tubes on the coast that spurt water high into the air), waterfalls, and we even got to make beautiful siapo (also known as tapa cloth, it is made out of the bark of the mulberry tree, pounded flat, dried and painted with natural materials–an art form very few are proficient in). 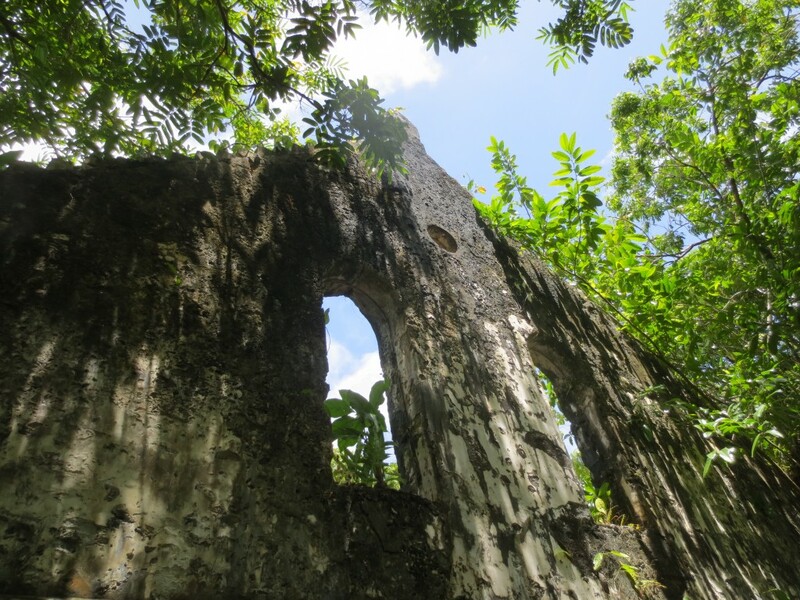 A ruined church from the volcanic eruption. 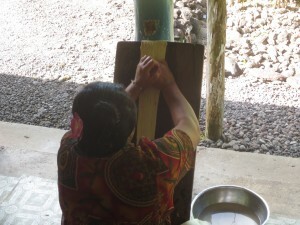 Pounding the siapo to make it wider. 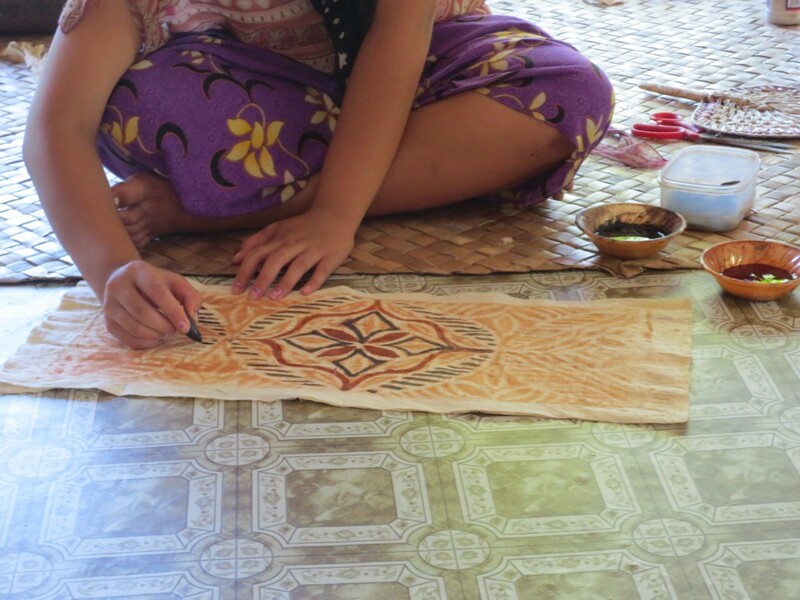 Painting the siapo with dye from the pandanus plant. I got to learn so much about the natural environment of the Samoan islands, as well as take in some nice “r and r” on the beach. Overall, an amazing experience, and I hope to get back to Savaii before I leave Samoa. Beautiful Afu A’au falls. A great place for a swim! A sea arch from our drive around the island. My class from a school visit. My host brothers and sisters. Maria, Salome, Niu, Toma and Lei. This past week I had a 10 day home stay in the rural village of Lotofaga on the south side of Upolu. This was an incredible experience. My host family consisted of 11 people, which was a very average family size for the village. I had a host mother and father, four host sisters, a host brother, a host brother-in-law, and three host nieces and nephews. They lived in a “palagi,” or “western” style house as opposed to the traditional open Samoan “fale.” Yet, though it was called the “western” style house, the only difference between it and the Samoan fale were four walls. 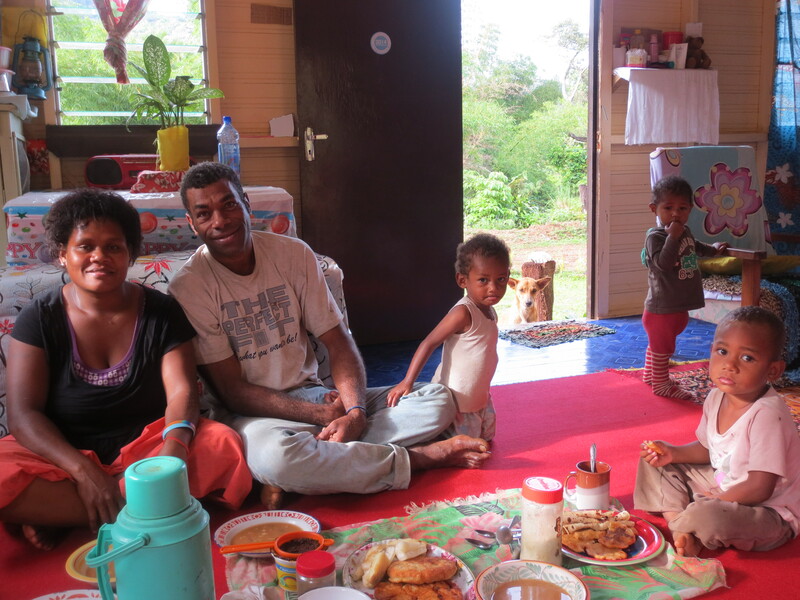 The family still ate, relaxed and slept on mats on the floor, the traditional Samoan style. There was one couch and one TV in the living room, but other than that there was no furniture. 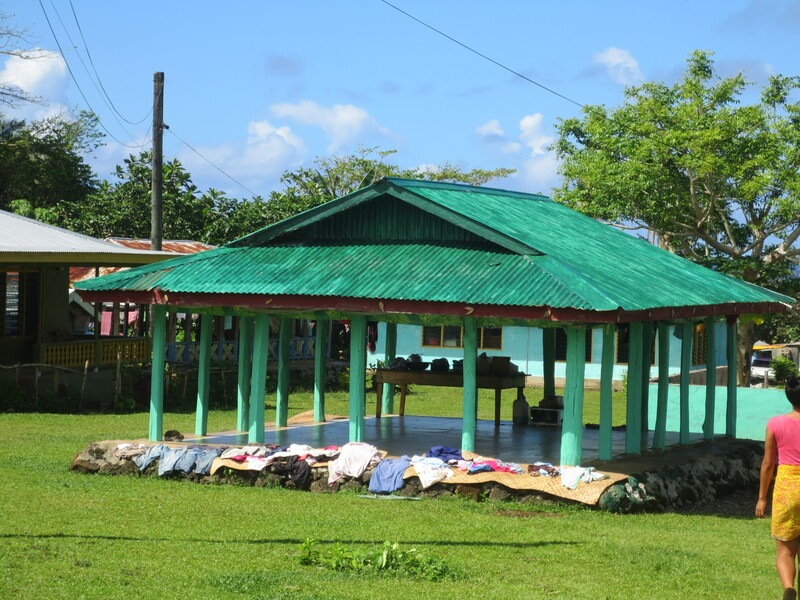 Typically the brothers and sisters all slept together on mats in the living-room, while the children and parents all slept in the traditional open “fale” just outside. The open fale next door. In the front yard was the traditional “fale,” where the family ate, relaxed and sometimes slept, as well as the graves. 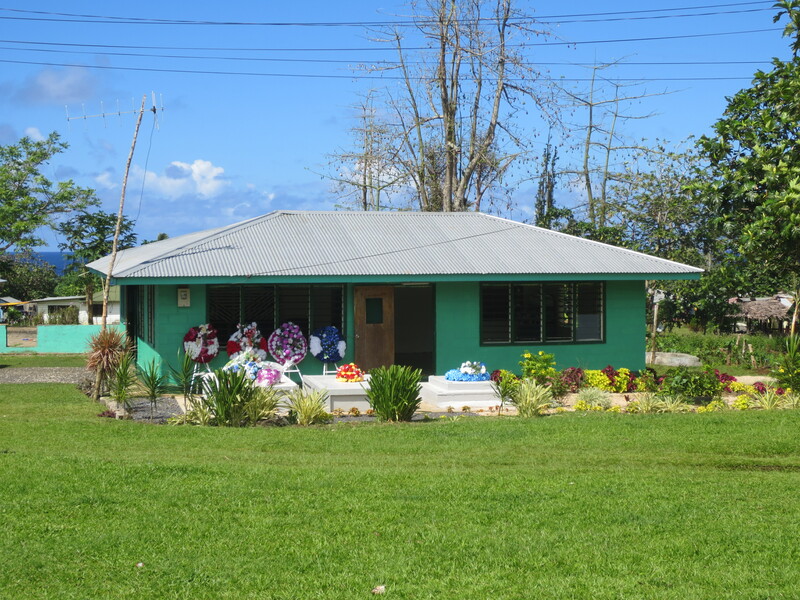 In Samoa, it is the norm to bury one’s family members out in front of the house to show the community the love they had for their relatives. Outside the house was the traditional Samoan kitchen called the “umu.” It was a pit in the ground where a fire is lit and rocks are placed on top until glowing hot. 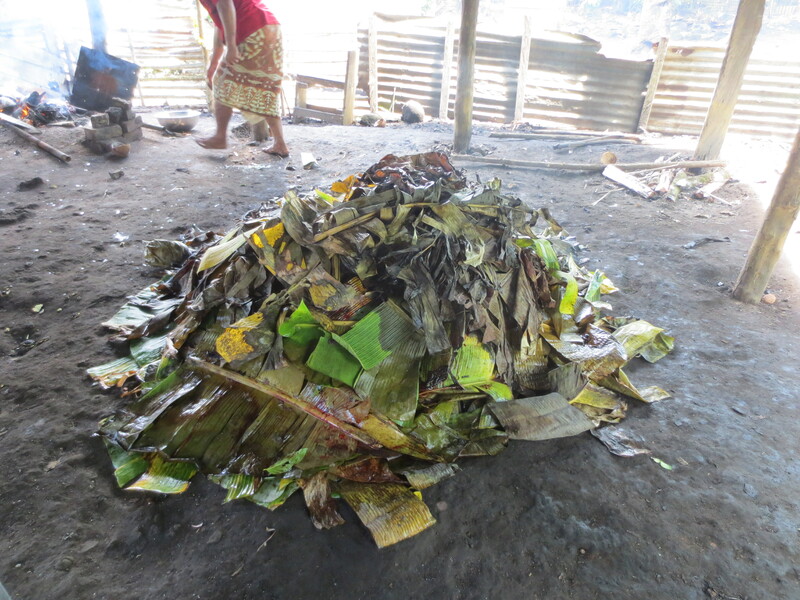 Then food is placed on the rocks, covered with leaves, and is left to sit for an hour or so until it is uncovered and the food is ready to be eaten. 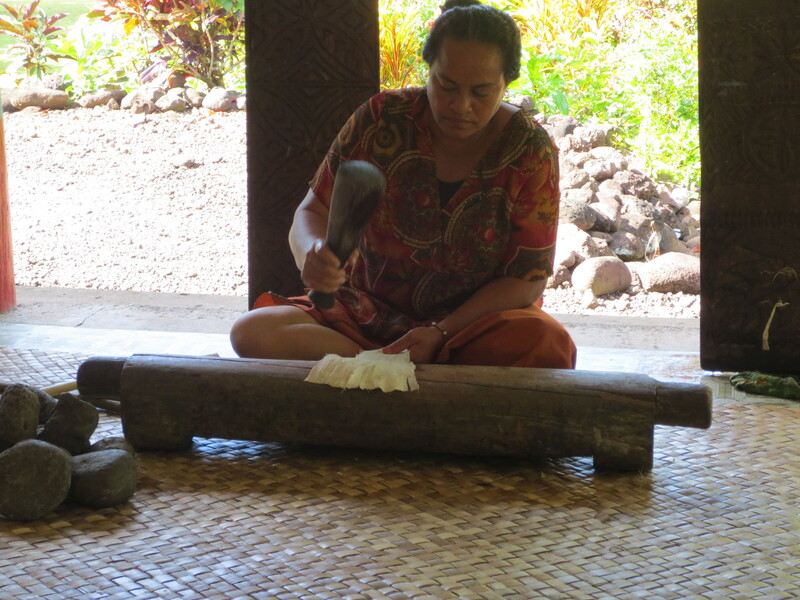 This is the traditional method of cooking, and because it is so labor intensive it is usually only done on Sundays for the “to’ona’i” or Sunday brunch. Preparing the “umu” or traditional earthen oven. Lunch of breadfruit, taro, green bananas, pumpkin, “palusami” (young taro leaves in coconut milk), octopus, and roasted pig on a homemade plate. Nothing beats an “umu” lunch! Near the “umu” was the bathroom. Called the “faleuila Pisikoa” or Peace Corps toilet (as their implementation was a big Peace Corps project in the 1970’s), it was a regular flush toilet that water was poured into because of a lack of pluming. The families will collect rain water in large tubs and use one tub for cooking, one for the toilet, one for washing dishes, and one for the scoop shower next to the toilet. Though I had a great time living in the village and learning about Samoan family life, it was easy to see that village life is hard. Many of the families live a completely subsistence lifestyle; living only off what they can grow in their plantations. Another issue was sanitation. In the village there was no hospital and none of the stores sold medicines or bandages. With no trash collection in the area either, much of the rubbish was thrown on the street or in uncovered heaps near the house. And with the only water being uncovered rain water scooped from giant tubs, the water could easily get dirty. Therefore, staying clean was a real challenge, especially if you got a cut. If one got injured, you had to be very mindful not to let it become infected (one of my friends got a terribly infected cut on her leg because of this). It was not uncommon to see many infected cuts and scrapes on children because of a lack of resources in the area. 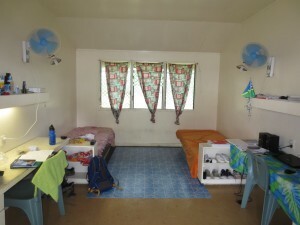 The village home stay was admittedly a challenge for me. However, overall I learned a great deal about Samoan life outside the capital, and I really did enjoy it. It was an experience I will never forget. Drinking a “niu” or young coconut while waiting for the “umu” to finish cooking. It’s so fresh and so healthy! The campus green with the big meeting fale (open house) in the background. 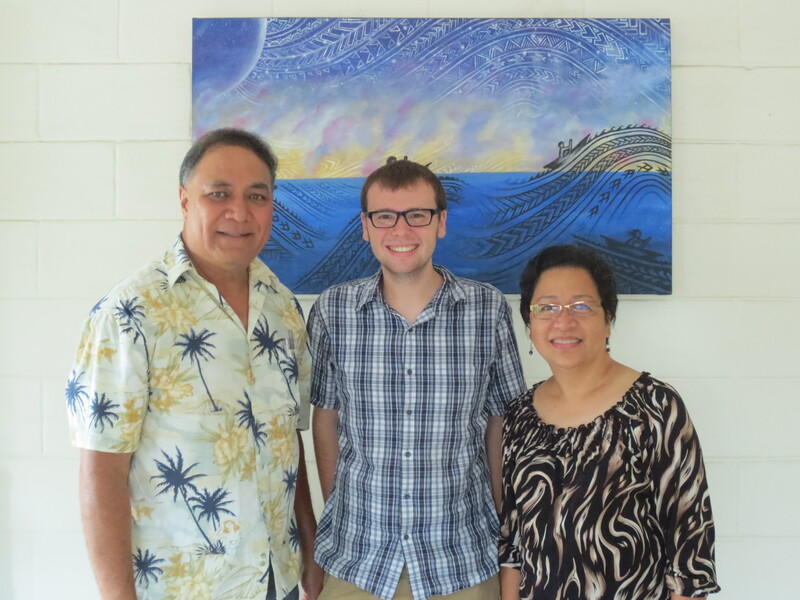 I am currently taking classes at the University of the South Pacific in Apia, Samoa. The USP is a fascinating and extremely unique organization. Because the islands of the South Pacific are scattered throughout thousands of miles, and many of the islands are extremely small, there had been difficulty throughout the years in establishing a university setting in any one of the countries. Therefore, the USP is co-owned and co-operated by many different island nations. The main campus is located in Suva, Fiji (the biggest city in the South Pacific), with other campuses scattered throughout the Pacific. The campus I am studying at is the Alafua Campus of Agriculture. 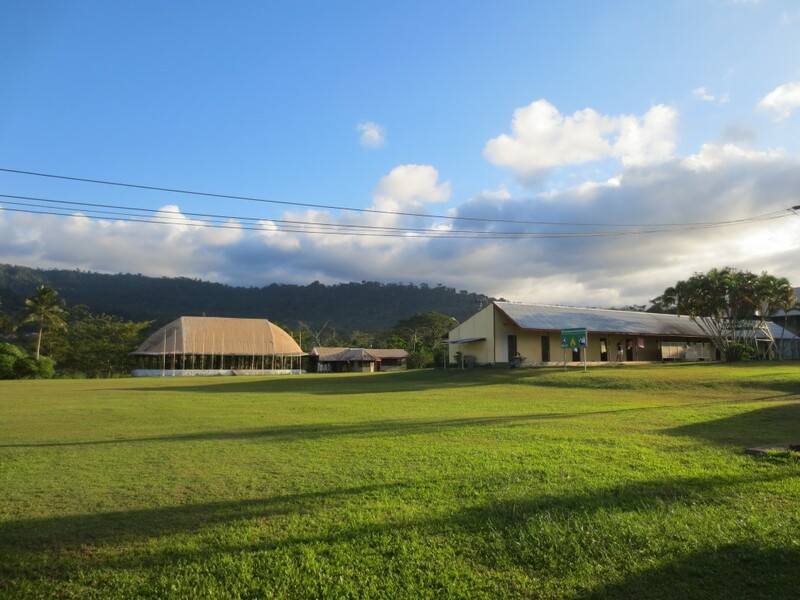 Therefore, all of the students here study agricultural sciences or agricultural economics, and are from a variety of countries including Samoan, Fiji, Vanuatu, Solomon Islands, Tonga, Kiribati, and others. As an SIT student, I take classes only with other SIT students about issues and culture in the Pacific region. However, we each have a room mate who is a Pacific Islander (mine being Solomon from the Solomon Islands), and we get to interact constantly with other Pacific Island students. I have gotten to do so much already with students from all across the region. 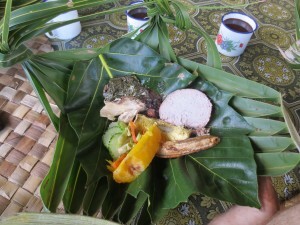 I have learned how to cook Indo-Fijian food, sing in Tongan, and play Samoan “suipi” (a card game). 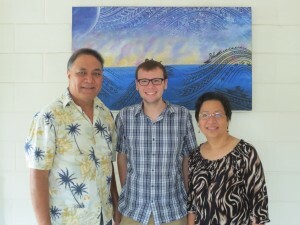 I look forward to learning more about the Pacific through my friends at USP this semester.